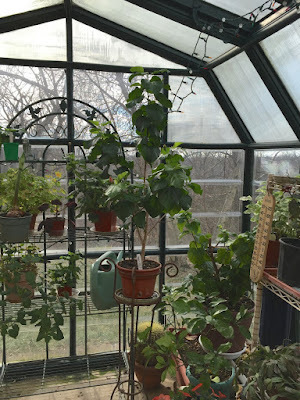 When I got in from this morning's sunrise sojourn, I headed down to the greenhouse. 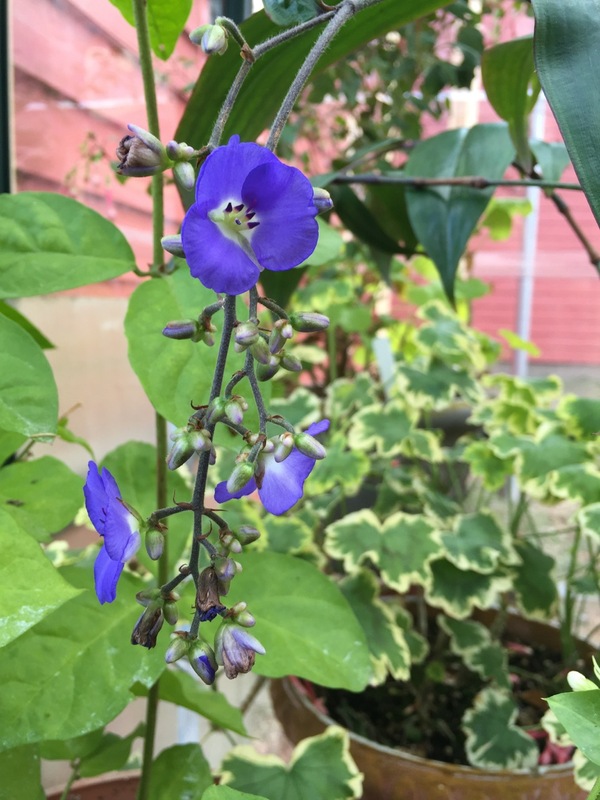 Dichorisandra pendula (a tropical spiderwort) is blooming nicely. We like it when plants bloom nicely. And when they don't, we take measures. 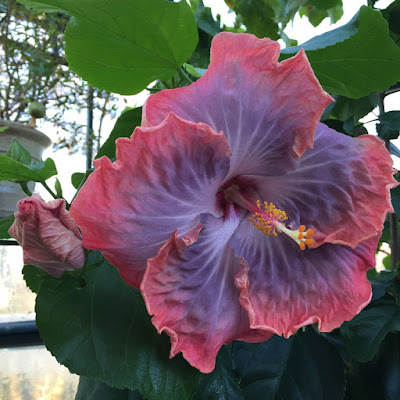 Two days ago, I finally bit the bullet and cut back my enormous hibiscus, "The Path." She had grown up and up until she was nearly as tall as I am. I had her wired together by her lanky arms (you can see the fine green wires running from branch to branch). But there was no getting around it--there was a lot of bare branch between the lower shoots and the blooming ends. Awkward. That's a lot of biomass for a very small greenhouse. Time to intervene. I had to steel myself for the cut. 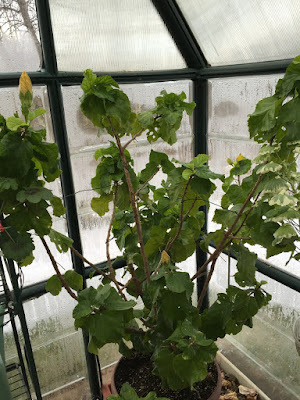 It was hard to do, but I knew that cutting the plant in January would give it the best chance of making fresh new growth that would burst into bloom by next fall. 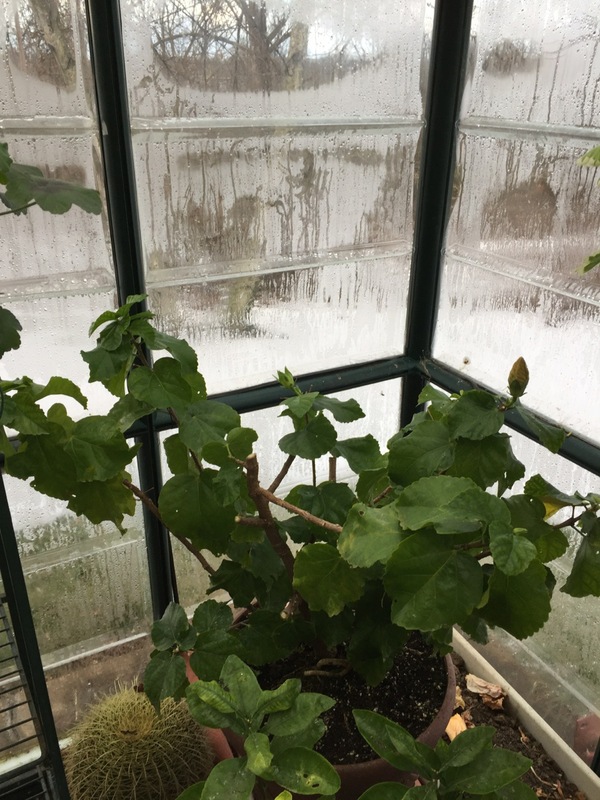 By next fall, I'd need some nice new growth full of buds. Besides, the plant was getting more and more aphids on the new growth, and having less biomass would make those easier to control. Arrgh. Chop. It's time. Bye. 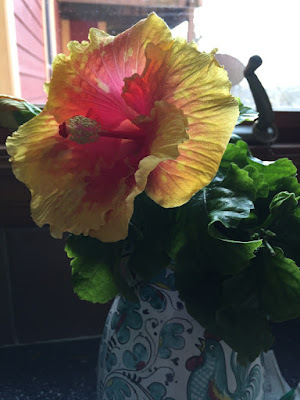 The aftermath: a thoroughly tamed plant, with a few consolation buds. You're off center stage for awhile, Miss Path. But I know you well: you'll come roaring back. The Path's cut tops are now blooming away in a vase in the master bathroom. That's a beautiful flower, but nothing like what she can do when she's happy. When a plant capable of making 8" saucers starts throwing 3" mini-blooms, it's time to intervene. And besides. The Zick has made cuttings, producing a couple of meet understudies. So there's a backup plan well underway. There's always a backup plan. This cutting took almost a year to send out a root, and another year to get to this point. I didn't lose hope. It's a slow process. But once she gets going, she really, really goes. This little gal is turned up to 11. 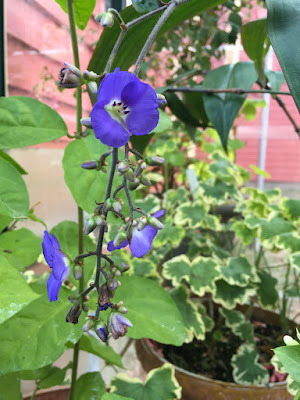 Byron Martin of Logee's Greenhouse, where The Path originated (as a gift from my dear friend Donna), says of this plant, "The Path actually blooms more than it grows." Center stage now is taken by Creole Lady, who is about to get a bigger pot. She's been throwing out luscious peach hued blooms all winter. You can see The Path hunkered down on the right. There's plenty of her left. And soon to be more. You have to love a hibiscus who does this all winter long. Here's The Path, with Creole Lady budding and blooming in front. Elsewhere in the greenhouse: Rex begonia "Cancun." 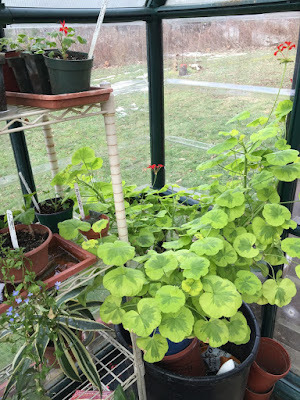 Happy Thought Red is going to take over the entire northwest corner of the greenhouse. Almost a yard across now! Time to make some cuttings! Lemme out! Spring's almost here! On patience and gardening: Last winter, my sweet friend Cindy sent me an amaryllis bulb. Variety: Bogota. It would have been white with red stripes. 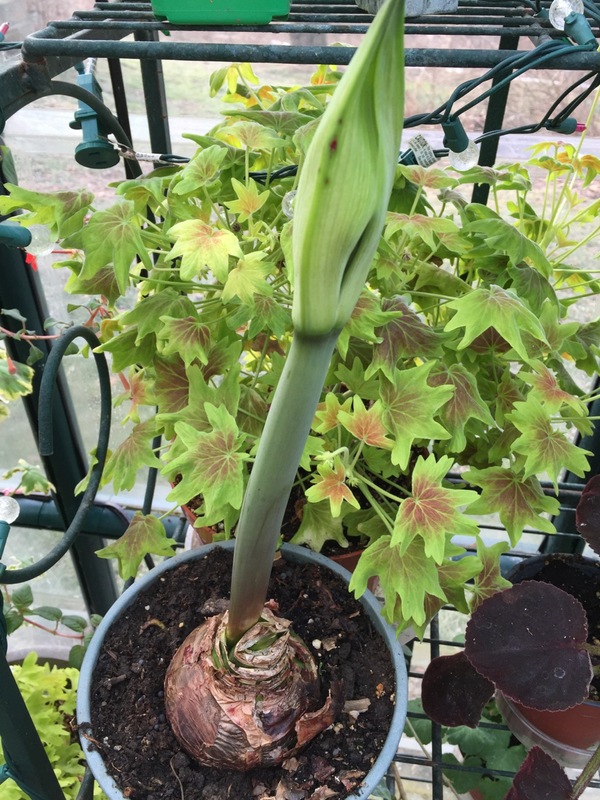 Well, this bulb sent up a tiny bud that bent over and withered before it bloomed. Whaa? From White Flower Farm?? I emailed Cindy to tell her the bulb had misfired. She got her money back from WFF. I continued to nurse the bulb. Eventually, Bogota threw out a bunch of long strappy green leaves. I kept watering it. I put it outside for the summer. I brought it inside the greenhouse this past fall. I kept it on the cool floor of the greenhouse. Finally in October, I stopped watering Bogota, and I cut the withering leaves off in early December. I moved it up from the floor to a warmer shelf. 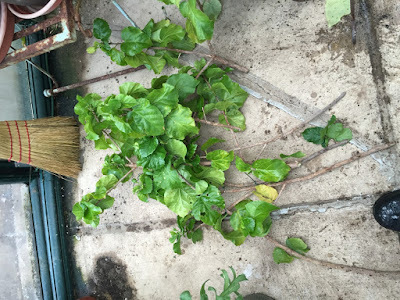 I repotted it in a mix of potting soil and aged cow manure. Was surprised to find a still-viable root system despite the total dryout. It didn't take long for the bulb to respond. A little green nose poked out! That nose is now almost a foot tall--I can almost see it grow before my eyes. And the other day I found another bud-nose poking out from the second leaf scar! 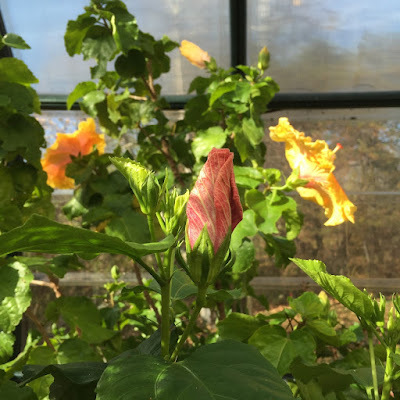 Bogota will bloom, twice over, next month! Faith in a bulb, faith in a stem. Plants, the most amazing renewable resource I know. I spent the weekend trimming back some plants, too. Lots of gangly plants that benefited from a haircut. 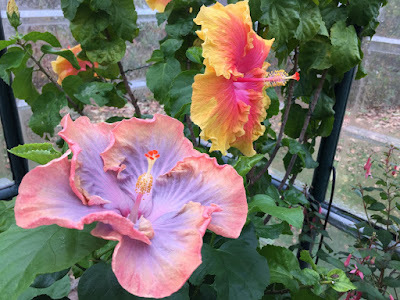 I love hibiscus but so do my deer! 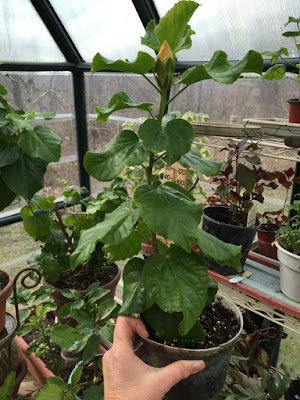 I've managed to hide Texas star hibiscus behind a few other plants and in the side yard garden enough that they don't chomp them, but anything else hibiscus-y out in center stage...well, that's a delicacy. Very jealous of your greenhouse. If I had one mine would be packed with orchids! *sigh* Thank you for the vicarious greenery! Here in upstate NY we're still hanging in a weird transitional state - temps above freezing, no snow, but not a bit of green. 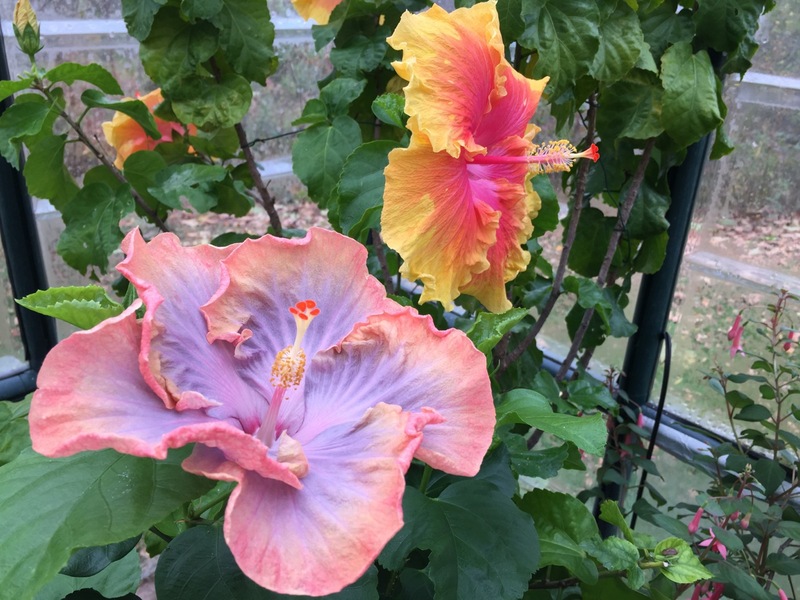 Your tropical ladies are just the burst of color I needed! I live Hibiscus us but everyone I've planted has succumbed to whitefly. On my walks I notice my neighborhood seems to have the same problem. Would you like a plumeria? I have rainbow and yellow and white. 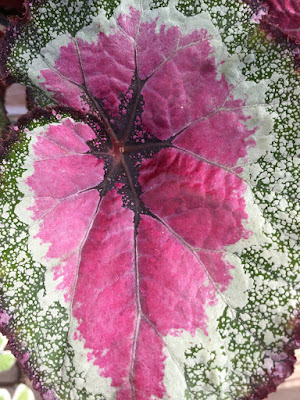 My ten-year-old pink geraniums are blooming in the basement in time for Immolc. 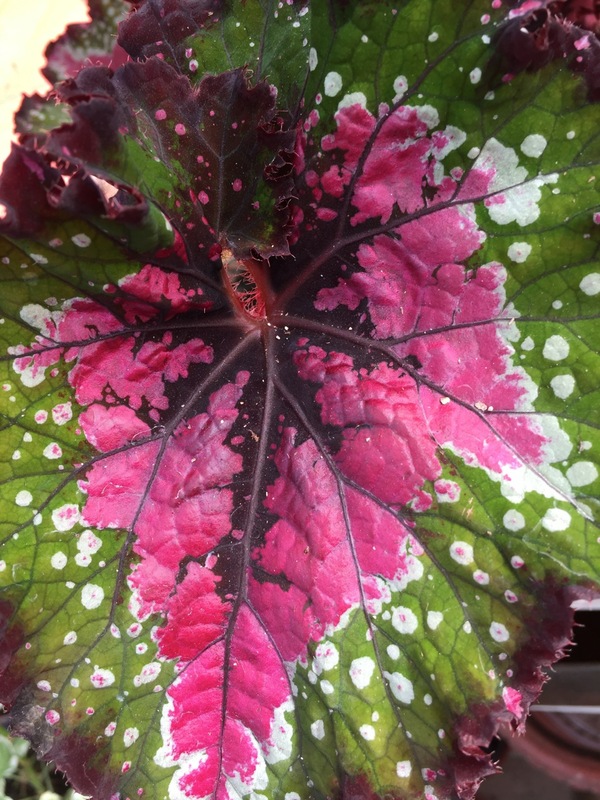 Begonias hanging at windows are next! 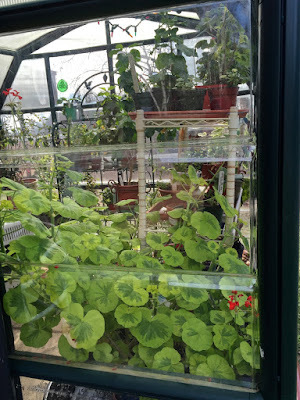 I love your green house posts. Well, all your posts :-). I I could figure out how to travel with a greenhouse, I would. I think plants help keep hope and faith alive and certainly enrich out lives. In the absence of my garden, I love sharing yours. Thanks.